Trader & Supplier of Color Sorting Machine & Industrial Color Sorter. Our product range also comprises of Biomass Gasifiers, Sterling Generators and Silent Generators. With our rich industry experience, we are engaged in manufacturing, distributing and supplying an extensive array of Industrial Color Sorter. As per the requirements of customers, this color sorter is accessible in varied specifications. Offered color sorter is used in agricultural and food industries for the purpose of sorting grains and seeds. Customers can avail this color sorter from us at reasonable prices in a stipulated frame. With the assistance of our team of professionals, we are engaged in manufacturing, distributing and supplying a wide range of Color Sorting Machine that is very durable and delivers high performance. 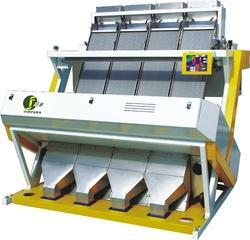 This sorting machine is used for removing worst materials from input seeds. This sorting machine is provided in different specifications & models as per the requirements come from customers. The given sorting machine is installed in rice mills to scan and detect the color of rice before the final packaging. Looking for Color Sorting Machine ?